What part of a flower are you eating when you eat an apple? Flowers are composed of modified leaves. Each floral structure represents a different modification of a leaf. Not all flowers have the same parts, but male and/or female structures are essential. The swollen tip of the stalk (#7) supporting the flower. You might think of a flower as a highly modified branch, the flower parts being highly modified leaves. Most sepals are green, but they can be brightly colored like the petals. Sepals protect the flower before blooming. All the sepals together are called the calyx. Attached just inside the sepals. Usually brightly colored to attract pollinators. All the petals together are called the corolla. Stigma (#1), the open top of the pistil. It is sticky so it can trap pollen grains. Style (#2), the hollow tube leading to the ovary. Ovary (#3), composed of fused ovules. Ovules, each ovule produces one egg cell. Anther (#9), produces pollen grains which contain sperm cells. Filament (#8), supports the anther. If this is done at home email quiz to instructor. If this is done in class turn quiz in. Paste the flower diagram above into a word document and enlarge the diagram. Cover the numbers, but not the arrows, with the name of the correct flower part. Label the pistil and the stamen. Put your name, date, class period and the assignment number at the top of the document. Use this plant family page to write the answer to these questions on the back of your printed word document. How many stamens does an iris flower have? Does a single willow flower have both male and female parts? How many petals does a buckwheat flower have? How many sepals does a potato flower have? How many petals does an elm flower have? How many ovules are shown in the cross-section of the chickweed ovary? How many ovules are shown in the cross-section of the lily ovary? Coffee is in the Rubiaceae Family. What type of fruit is produced by a coffee plant? What is the difference between a simple pistil and a syncarpous pistil? What is meant by the term Gynoecium? Explain what different Gynoecium pistils may look like? Bright petals on flowers attract insect pollinators. Since the flowers of grasses don't have petals to attract insects, how are they pollinated? Scientist Pollination: the transfer of pollen from anther to stigma. Self-pollination is the transfer of pollen from one flower to another on the same plant. Cross-pollination transfers pollen from one plant to another of the same species. Fertilization: the joining of sperm and egg in an ovule. Before fertilization can occur, the pollen grain on the stigma has to germinate. Each pollen grain contains a tube cell and a generative cell. The tube cell forms a pollen tube that grows down inside the style to an ovule. The generative cell divides to form two sperm that move down the pollen tube. 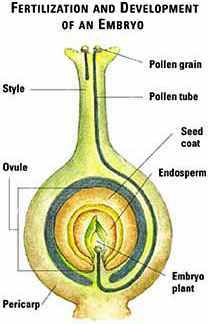 The pollen tube provides a pathway for the sperm to reach the egg cell in the ovule. One sperm fertilizes the egg cell and together they form the zygote. The other sperm unites with the polar bodies in the ovule and together they form the nutritive tissue for the zygote. Explain the difference between pollination and fertilization of a plant. Using concepts of genetics, explain why cross-pollination is better than self-pollination. Many flowers are pollinated by animals. Why do animals go to the trouble to pollinate flowers? How are the flowers of a corn plant pollinated? In addition to bees and butterflies, what other animals are common pollinators of flowers? What is the scientific name of a honey bee? What are the two types of cells in a pollen grain? Explain the function of each. In a paragraph explain what a Horticultural Scientist (Horticulturist) is and does? Name 5 different courses a student must take in order to become a Horticulturist. An embryo plant and cotyledon are found inside a seed. What is the purpose of the cotyledon? Fruit: a ripened ovary with seeds. Dry: fruits with papery or leathery walls. Fleshy: fruits with soft, usually moist walls. Simple fruits develop from one carpel or carpels that are united. Aggregate fruits are formed by flowers having several separate carpels. Multiple fruits are a group of many fruits formed by a cluster of flowers. Grapes: a simple, fleshy fruit. A seed coat forms from the ovule wall to protect the seed. The cotyledon is formed by the combination of the second sperm and the polar bodies. The root of the embryonic plant in the seed is know as the radicle. The hypocotyl will form the stem of the new plant. The leaves of the embryonic plant are collectively called the epicotyl. Germination: when a seed begins to grow into a new plant. Seed dispersal: spreading of seeds away from the parent plant. Test your knowledge of plant parts. What multiple fruit has a picture linked on this Botany Class page? What is the name of the dry fruit produced by a pea plant? Which of these Oklahoma plant families produce seeds with one cotyledon, and which with two? Based on what you know about their fruits and seeds, are the seeds of each of these commonly dispersed by wind, water, or animals? The seeds of some trees will not germinate unless they are exposed to temperatures above 500 oF. Write a paragraph explaining the advantage to this apparently odd characteristic. When you eat an apple, you are eating the mature ovary of an apple flower. The "core" is composed of the ovules containing the seeds. The pollen of grasses is spread by the wind. The seed cotyledon provides food for the embryo plant until it can grow leaves and begin producing its own food.